The other leg doesn't look much better. And I never even saw them coming. Never felt them biting. Never heard their pointy straw like apparatus jamming into my skin over and over again. If you haven't figured out by now, I'm here in Jamaica. My weeklong twitter and facebook campaign to find someone to go with me and the kids**was a bust, but I finally told my mother-in-law she had no choice convinced my mother-in-law to come with us. We got here yesterday and will be Philly bound on Sunday afternoon. I'll be live blogging (and tweeting via @JulieBouf) all week. Well live plus the 6,345 minutes it takes to upload each photo. And tweeting meaning, on my laptop - since it would cost about $7,234 in data charges every time I turn my phone on. Check back frequently this week, I'll be posting a lot. Randomly. Throughout the day. Whenever I feel like it, mon. 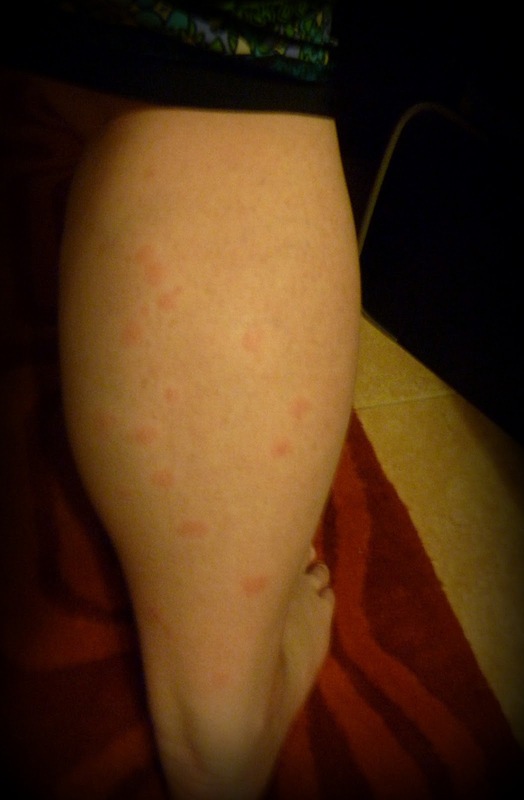 *I'm positive that my calf isn't really this large and that it MUST be swollen from all of these mosquito bites. Swollen skin and rock hard muscle (NOT 32 years of overeating and overall laziness). **If you really have no idea what I'm talking about, shame on you. My husband realized it really wasn't possible to take off from work, after all, just one week before our vacation. Good times. It's all I talked about for a week straight. And to everyone here in Jamaica. Hell, even my 5yo greeted our resort greeter with,"Hi, we're here for our vacation. We brought grandma cause my daddy has to work and couldn't come and we'll call him on the telephone every night." LOL about Katie telling the greeters.